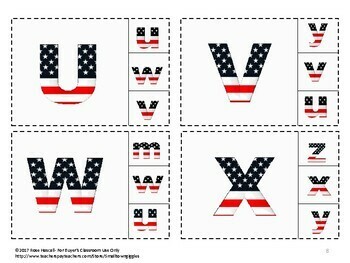 American Symbols Task Card packet, students will practice upper/lower case Alphabet recognition. 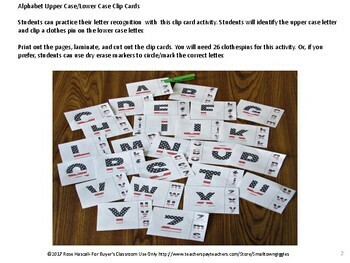 These 20 Clip Task card will work well in your literacy centers for preschool, kindergarten, special education and students with autism. 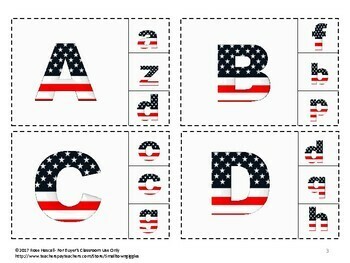 These low prep worksheets will work for Patriotic Holidays; Patriots Day, Memorial Day, Flag Day, 4th of July, Veterans Day. You may use them for early finishers, morning work, or in your emergency sub plans. This set contains 20 task cards. Print out the pages, laminate, and cut out the count and clip cards. You will need 20 clothespins for this activity. Or, if you prefer, students may use dry erase markers to circle the correct number. Please click on the STAR above to "Follow Me" and receive updates on new products and free downloads. Please leave feedback to earn TPT credits that can be used on future purchases. 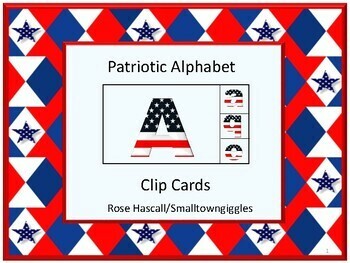 For more no-prep/low prep cut and paste worksheets, file folders, math, puzzles, coloring pages, life skills products and more, visit my store. Digital Millennium Copyright Act (DMCA). You may NOT post any of my products on school websites or online anywhere. Thank you for shopping my store.